Peridot, one choice for August birthstone jewelry, is a yellow-green gemstone believed to instill the wearer with power and influence. Ancient Egyptians called peridot the ‘gem of the sun’, because they believed it protected them from evil spirits and ‘terrors of the night’. The Crusaders brought peridot from the Red Sea island of Zabargad to Europe in the Middle Ages. In 2016, spinel was designated as an alternative August birthstone by jewelry trade associations. This gemstone occurs in many colors, but red spinel is the most popular. It is also close to the ruby in appearance. If you prefer red, see the collection of July Birthstone Jewelry. 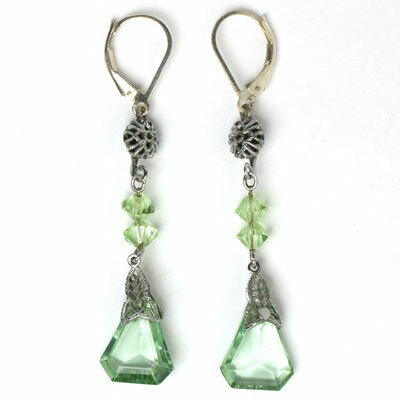 These vintage teardrop earrings each have a faceted, peridot-glass stone with a decorative silver-tone metal cap. It drops from diamanté-embellished links. The yellow-metal shepherd hooks on these delicate and elegant 1920s pendants make me think they are European in origin. Most of the diamanté are cloudy, but they do not detract from the appearance of these beauties – the star attraction is each pale-green-glass drop. 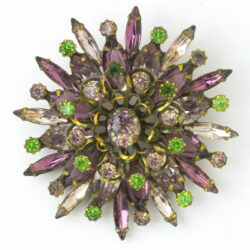 The perfect adornment for a woman who loves Art Deco and looks best in warm colors! 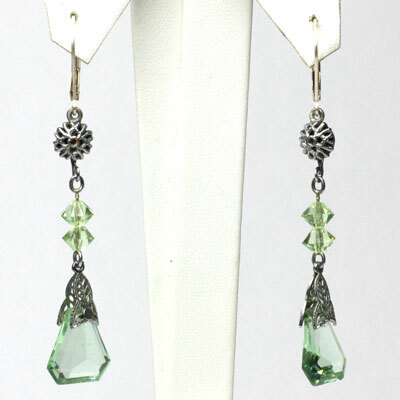 These vintage peridot earrings have faceted glass stones capped with silver-tone filigree. 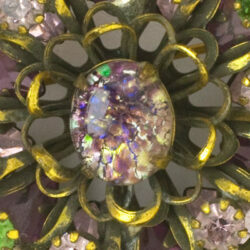 The pendants are accented with peridot-glass beads and silver-tone filigree disks. Peridot is a hard-to-find color. The original screw-backs were converted to sterling silver ear wires with lever backs for pierced ears by my expert jeweler. These 1920s earrings are long and lovely!